The F-22 Raptor is the only US fighter design with the stealth, speed and agility to defeat the new Russian PAK-FA design. To be highly effective against the PAK-FA, it will need a range of upgrades, including a new technology infrared sensor. 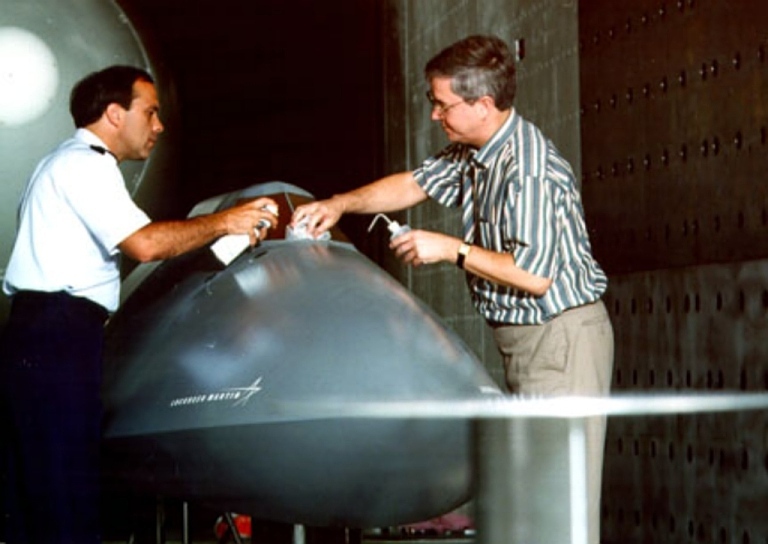 Depicted technicians at the USAF AEDC performing low observables testing on an electro-optical sensor fairing, developed for the AIRST sensor. The AIRST was deleted from the F-22 avionic suite during development as a cost saving measure (US Air Force image). Imagine an apocryphal story of three fighter pilots meeting in the bar at an air combat conference in Stockholm, in the year 2015. Chuck is a NATO F-22A Raptor pilot based in Germany, Boris an Su-35-1 Flanker E Plus pilot flying from one of the bases protecting Moscow, and Johan, a F-35A Lightning II pilot from the Netherlands. All are masters of their craft and after drinks, “merely to lubricate the vocal chords”, they do what fighter pilots all over the world do – swap stories and make claims about their beloved aircraft. Chuck starts. “I’m king of the skies,” he claims. “I supercruise at 52,000 feet and Mach 1.7. Boris, I can see you from ~100 nm, and my AIM-120D launch range at this Mach is 70 nm. You are one dead Flanker.” Boris acknowledges the performance of the APG-77 and the Raptor, but replies, “Your missiles are easy to avoid. When you fire, my OLS-35 will see the flare, and I will turn away to out-run the missile. You need to fire closer than 50 nm – even then at 50,000 feet and Mach 1.2, my Flanker can out-turn your missile. If you are side or rear on I can get a lock-on at ~40 nm and I have a choice of seeker heads, so you might wear an R-77M in the backside.” “No way Boris,” Chuck replies, “I know that game. I’m head on and you can’t see me until about ~15 nm. If I have not killed you at 50 nautical, I’m outa there at the speed of heat.” Boris and Chuck concede that there might be a nil-all draw, with Chuck being untouchable because of the Raptor’s stealth, altitude and speed and the well defended Su-35-1 defeating the Raptor’s missiles . Now Boris makes his point. “Comrade Johan, I have something special for you. My IRBIS-E will see you head-on at ~25nm, but I fly my boys very wide and share the paints on our digital network. At side and rear looks, I see you at ~45 nm and my ramjet RVV-AE-PDs can get you at that range.” “No way”, Johan responds, “my APG-81 radar will see you at ~75 nm and I can launch at 50 nm. If you fire, my DAS will see the missile at launch, so I’ll turn away to break lock”. “And my wingman will see you in the turn, computer network will still know where you are, and we will skewer you in the cross-fire” is Boris’s riposte, “and you will run out of missiles before I do, If I duck your AIM-120D shots, I will win easily”. They bicker about the strengths of their own aircraft and weaknesses of the other’s and Johan grudgingly agrees the Flanker might be the winner. Chuck and Johan stay in the bar after Boris is unexpectedly ‘called away’ by men in dark coats, and agree that work needs to be done on improving the AIM-120D’s terminal lethality. Essentially, this is a deadly play between stealth, agility, sensors and missiles. From the front quarter the Raptor’s 0.0001 square meter Radar Cross Section (RCS) and the Lightning II’s 0.001 square metres make them difficult targets. The Flanker-E Plus, while having a reduced radar signature, still has a residual RCS of about 2 square metres, such that the F-22A and the F-35 will see the Su-35-1 way beyond their missile launch range. The Su-35-1 struggles to see the F-22A on radar, but can find the F-35’s 0.01 square metre lower side and rear RCS. The AIM-120D is a fine missile, but the Su-35-1 has finer defences, so the missile kill probabilities are likely to be low. When out of missiles, the F-22 Raptor can escape. The F-35 Lightning II cannot. A more likely future scenario is that Boris will be banned from subsequent air combat conferences, so we must rely on more conventional air combat operations analyses. If we move forward just a couple of years, say to the year 2017, and the PAK-FA is operational, there is a profound change in air combat engagements. Suppose the Russians don’t quite master stealth to the degree of the F-22A, but manage a RCS of 0.01 square metres from all aspects. The F-22A’s APG-77 will detect the PAK-FA at ~40 nm and the F-35’s APG-81 at ~30 nm. Passive electronic surveillance might increase detection ranges, but this still makes long-range missile shots problematic, as tracking depends upon the opponent emitting, which smart opponents will try not to do. The PAK-FA’s radar can be expected to be an improvement on the IRBIS-E so at front-on aspects might detect the F-22A at ~15 nautical miles and the F-35 at ~28 nautical miles; and from side and rear aspects, the F-22A at ~43 nautical miles and the F-35 at ~51 nautical miles. Infrared sensors are the next growth area in air combat. Every air combat jet has unavoidable infrared signatures – converting kerosene into thrust at prodigious rates does that. The existing OLS-35, developed for the Su-35BM, is credited with the ability to detect a ‘fighter type’ target head on from 27 nautical miles, and from behind at around 50 nautical miles, through a 90° sector. It uses conventional detector technology, and provides similar performance to the Eurofighter Typhoon PIRATE infrared sensor. 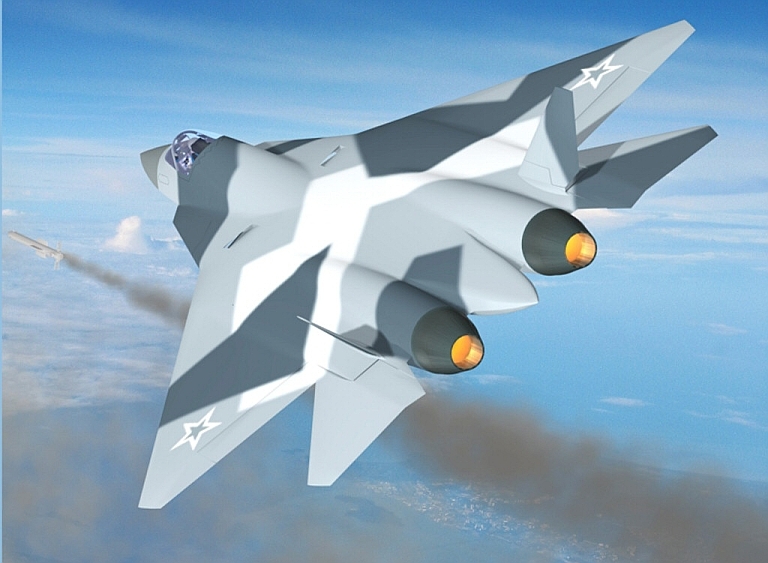 It is likely the PAK-FA will have infrared signature management as is found on the designs of the YF-23A, B-2A and the F-22A, but not on the F-35 . The emerging technology of Quantum Well Imaging Photodetectors (QWIP) is set to cause an upset in this market sector. Advances in QWIP technology single chip imagers will see a new generation of infrared sensors deploy over the next decade. 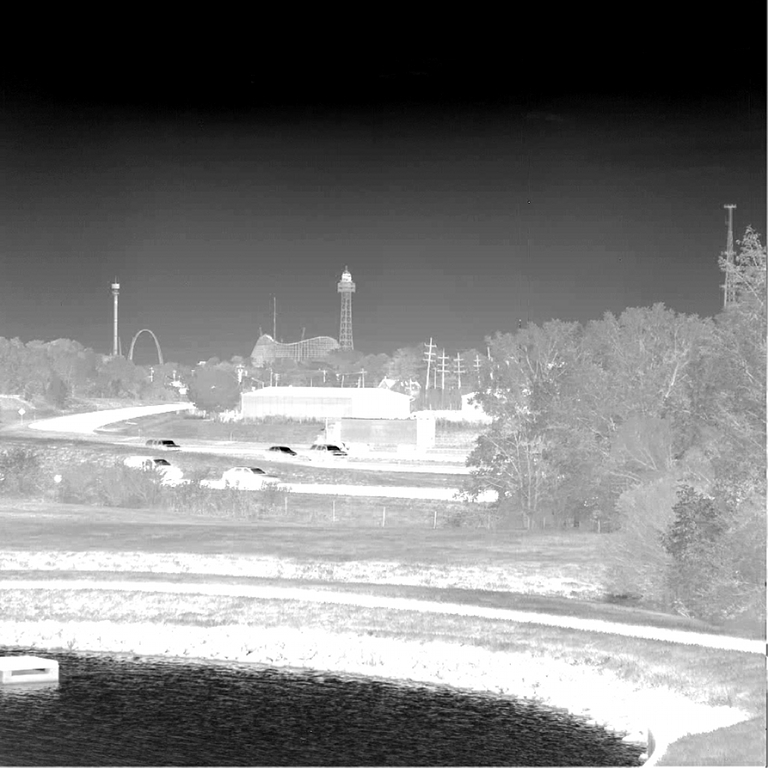 Not limited in infrared colour sensitivity like legacy bandgap imagers, QWIP imagers offer the potential to detect cooler targets are greater distances, and provide the high resolution required for standoff identification of targets. Above 10.2 micron band 10242 pixel longwave image produced by a US Army Research Lab / L-3 Cincinnati corrugated QWIP [no image enhancement applied], depicted below. QWIP technology is now available in the US, EU and Russia (Images refer Choi and Forrai, Corrugated quantum-well IR photodetectors see light in higher definition, 16 September 2008, SPIE Newsroom. DOI: 10.1117/2.1200808.1237.). Legacy bandgap detector imagers cannot compete against the emerging higher resolution colour tuned QWIP imagers. Above: current podded variant of the longwave LM AAS-42 InfraRed Search Track sensor (C. Kopp image). Below: AAS-42 installation on the F-14D Tomcat, now retired (US Navy image). QWIP based imaging Infra Red Search and Track (IRST) detectors can be “tuned” by design for sensitivity in a particular infrared band, using a fundamentally different detection technique to conventional “band gap” detectors where the material determines the colour sensitivity of the detector. First commercialised by Germany’s AIM/Diehl-BGT, QWIPs have since been adapted for ballistic missile defence applications. QWIPs have also been built to operate not only in the “conventional” midwave and longwave infrared bands, but also in the “very longwave” 15 micron band to detect very cool targets. QWIPs capable of simultaneously imaging in two, three or four infrared bands have also been manufactured and marketed. QWIP technology, therefore, opens up the potential for even greater detection ranges against targets cooler than what current production infrared sensors can track, and provide for much better infrared background rejection. Consider a QWIP technology “OLS-50M” installed in the PAK-FA. 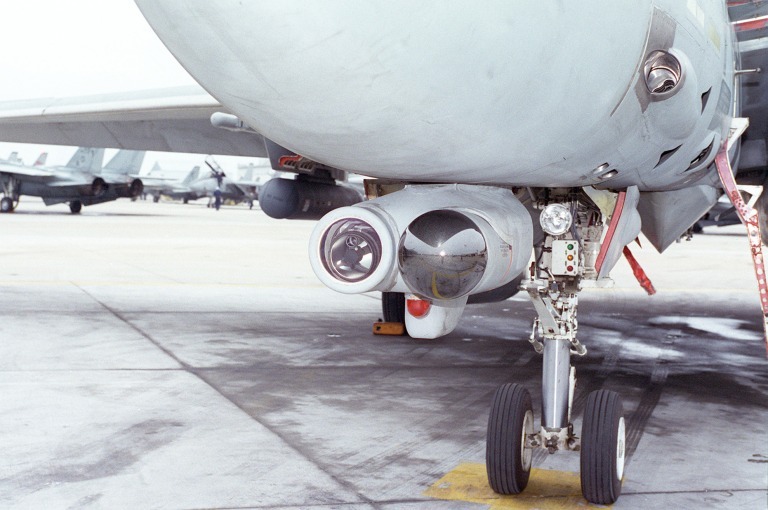 Such a device could be design-optimised for simultaneous detection and tracking of aircraft exhausts, jet-plumes and missile flares to ranges of 70 nm and beyond – the limiting factors are the size of the optics, cooling system and detector area. 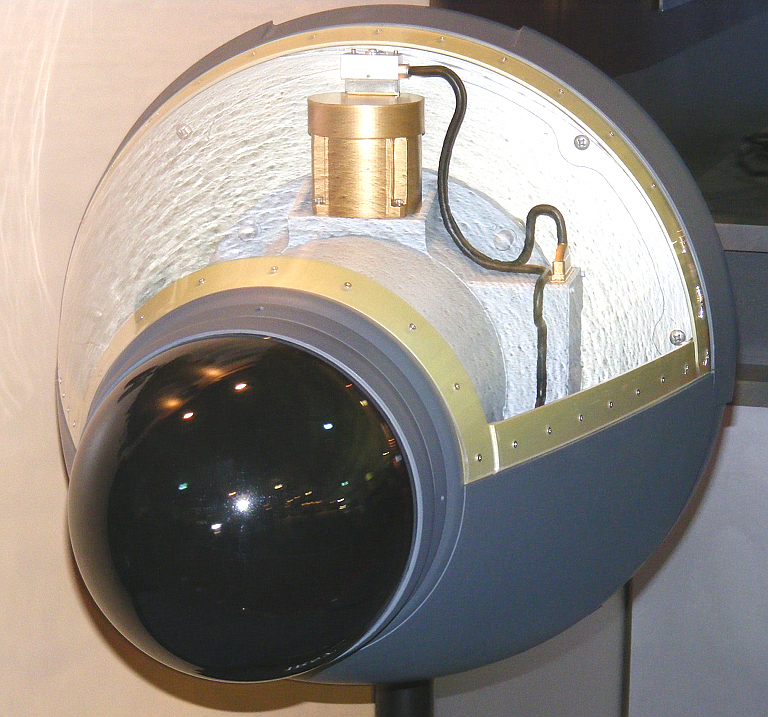 Russia has decades of experience in the integration of infrared sensors into its weapons systems, and QWIPs could well become the primary sensor and radar the secondary. This means that the F-22A AN/ALR-94 will be denied signals to detect and track the PAK-FA. The ‘shooting match’ shifts from radar-centric to ‘infrared centric’. The problem here is that the PAK-FA will have it, the F-22A does not, and the ability of the F-35 EOTS and DAS to make long range aircraft detections and guide weapons is at best ‘unproven’. The F-35 systems have not been designed to be highly sensitive at the task of searching and tracking distant aircraft at those infrared colours where aircraft and their jet engines emit most of their infrared energy. An understanding of the physics, or for the ever-hopeful, a simple Developmental Test and Evaluation exercise will demonstrate this. With the Beyond-Visual-Range (BVR) radar detections being reduced to distances below 60 nautical miles and infrared sensor detection ranges growing beyond 50 nautical miles, a new generation of missiles will be required to dominate the battlespace. Russian missile companies have shown much more flexibility and adaptability in the design of missiles, so the PAK-FA could have a new-generation of shorter range, but higher agility missiles – a fusion of the ideas in the R-74 and R-77M, with a diverse mix of seeker heads. These missiles will likely be cued by the IRST sensor, be equipped with inertial midcourse guidance and, probably, mid-course guidance update capability transmitted either by radio, or possibly infra-red laser or millimetric wave links. Expect the PAK-FA to have vectored thrust and high levels of agility like the Flankers it is to either replace or complement. Long missile range requires large rocket or ram-jet motors and these heavy weapons lack the agility to pull high terminal ‘G’, and may be ‘ducked’ by the PAK-FA as easily as by the Su-35-1. The PAK-FA will use a new super-cruising engine, based on technology from the Al-41F series, so its tactic might be to maintain combat speeds of about Mach 1.5 and use a more compact version of the ramjet RVV-AE-PD. A supersonic launch enables a ramjet to light without a powerful booster – thereby denying an opponent the detection of the usual missile launch flare. Fights between the F-22A and the PAK-FA will be close, high, fast and lethal. The F-22A may get ‘first look’ with the APG-77, the Advanced Infra Red Search and Track (AIRST) sensor having been deleted to save money, but the PAK-FA may get ‘first look’ using its advanced infrared sensor. Then, the engagement becomes a supersonic equivalent of the Battle of Britain or air combat over North Korea. The outcome will be difficult to predict as it will depend a lot on the combat skills of the pilots and the capabilities of the missiles for end-game kills. There is no guarantee that the F-22 will prevail every time. The fate of the F-35 Lightning II would be far worse in an air combat environment challenged by the PAK-FA. If the Mach 1.5 PAK-FA is using its infrared sensor as the primary sensor and observes radio frequency emission control (EMCON), then the first detection by the F-35’s APG-81 radar could be at ~20 nautical miles or less with a missile launched by the PAK-FA’s infrared sensors already inbound from 60 to 70 nautical miles away. The PAK-FA could easily break to a direction outside the F-35’s AIM-120 engagement zone. The sustained turning performance of the F-35A Lightning II was recently disclosed as 4.95 G at Mach 0.8 and 15,000 ft. A 1969 F-4E Phantom II could sustain 5.5 Gs at 0.8 Mach with 40 percent internal fuel at 20,000 feet. The F-35 is also much slower than the 1960s F-4E or F-105D. So the F-35A’s aerodynamic performance is ‘retrograde’ when compared with 1960s legacy fighters. The consequence of such inferior JSF performance is that its DAS might detect an incoming missile, but the aircraft lacks the turn-rate to out-fly it. As the F-35 also lacks the performance to engage or escape, repeated ‘freebie’ shots from the PAK-FA could inflict high losses. Expect the exchange rate to be of the order of 4:1 in favour of the PAK-FA, possibly much higher. Russian aerospace companies have demonstrated an ability to outpace US aerospace manufacturers in terms of delivery of an operational capability and also the diversity of the capabilities of their weapons systems. The cumbersome US acquisition system, and marketing rather than technology driven aerospace industry, put the US at a distinct competitive disadvantage in rapidly adapting to an evolving threat environment. The most dangerous situation the US could face, is where the high and upwardly spiralling development and production costs of the JSF ‘cuckoo’ the available resources, which are needed to develop the advanced capabilities necessary to counter the new Russian PAK-FA, and the generation of new weapons which the PAK-FA will inevitably be armed with. Complacency is not an option. Having ruled the roost for the decade out to 2015, the F-22A may be knocked off its perch by a newcomer, unless the US invests in new sensors, especially, and advanced technology Infra-Red Search and Track, stealth improvements and a new generation of missiles for the F-22 – assuming it even builds more than the token number of F-22s currently planned. The F-35 has already been neutralised and negated by the Su-35-1/35BM and will be substantively overmatched by the PAK-FA. The West needs to think long, hard and fast about the PAK-FA, as the current and retrograde “F-35 centric” future fighter fleet model guarantees certain defeat in future combat. PAK-FA rendering by NPO Saturn. Unlike the JSF, the stealthy PAK-FA is being designed with air superiority performance and high agility as the primary consideration. To date only speculative renderings have been released, making assessments difficult (Saturn NPO). Su-35-1 Front Aspect= 2 m2. Boeing F-15SE ‘Silent Eagle’. This low-signature version of the F-15 Eagle was assessed during the compilation of this NOTAM. Its radar cross section, while claimed to be comparable to the export configuration of the F-35 from nose-on is likely to be substantially inferior from other aspects. Its infrared signature will be similar to the standard F-15 Eagle. Thus, the PAK-FA using radar will detect the Silent Eagle at a range sufficient to launch BVR missiles and at similar or greater ranges to the F-35 for infrared-based engagements. Flying wide sweeps and distributing sensor detections as is done for the legacy Sukhois will enhance radar detections and enable IRST ranging. The advantage the F-15SE Silent Eagle has over the F-35 JSF is that it has the aerodynamic performance and fuel reserves to egress from a dangerous air combat engagement.